PHILADELPHIA, June 18, 2018 /PRNewswire/ -- The Preservation Alliance for Greater Philadelphia presented Apartment Investment and Management Company (Aimco) (NYSE: AIV) with a prestigious Grand Jury Award for retaining the rich history of the mid-century Sterling Apartment Homes while providing a distinctive 21st century living experience. Aimco was among an elite group of winners honored during a recent ceremony. Aimco was honored for its sensitive rehabilitation of The Sterling Apartment Homes which preserves the building's rich history while transforming amenities to complement the lifestyles of today's residents. 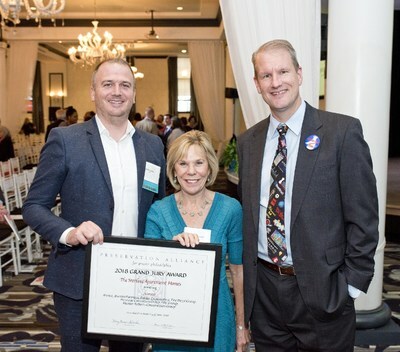 Aimco's Regional Property Manager Richard Derby and Senior Vice President Patti Shwayder are joined by Paul Steinke, Executive Director of the Preservation Alliance for Greater Philadelphia, as they accept a Grand Jury Award for the rehabilitation of The Sterling Apartment Homes. The Sterling was one of the first multifamily buildings in the Commonwealth of Pennsylvania to be listed on the National Register of Historic Places. Designed and constructed between 1959 and 1961 as part of Philadelphia's urban renewal initiative led by Edmund Bacon, the block-long Sterling residential and community development was planned to turn a then-gloomy Center City into a vibrant, urban, live/work environment. The Alliance recognized Aimco's sensitive rehabilitation of the large-scale building as a model of preservation. "Aimco's investment in the renewal of The Sterling is not only deserving of recognition as an outstanding example of historic preservation, but also symbolizes the latest chapter in the ongoing revitalization of Center City Philadelphia," said Paul Steinke, Executive Director, Preservation Alliance for Greater Philadelphia. "We are thrilled to receive the award from the Preservation Alliance, which represents years of hard work by our dedicated team," said Aimco Senior Vice President Patti Shwayder. "The Sterling is a prime example of Aimco's commitment to honoring the architectural significance and intent of historic properties while introducing comfort, convenience and modern amenities to meet the needs of today's residents. A true live/work environment in the heart of Center City Philadelphia, The Sterling offers our residents an exceptional, modern living experience while surrounded by history." The repositioning of ground floor retail which is now home to vibrant businesses including Misconduct Tavern, bao*logy, Old Nelson's Food Market, I'm Sergio hair salon and Square One Coffee. The expansion of the fitness center to encompass the entire second floor operated by City Fitness. Renovation of 534 apartment homes, ranging from studios to 3-bedroom units to include modern appliances, lighting, flooring and finishes, and many featuring large floorplans and exceptional views. Updating the building amenities including a distinctive 30-story high rooftop with a chef's kitchen, multiple fire pits, big screen televisions, a pool deck and lounge areas, and an incomparable 360-degree view of the City. This year's Grand Jury award is the second consecutive honor earned by Aimco for historic rehabilitations in Philadelphia. In 2017 Aimco was recognized for the revitalization of Park Towne Place Museum District Residences on the Benjamin Franklin Parkway, the first mid-century modern multifamily community in the Commonwealth to be listed on the National Register of Historic Places. Aimco is a real estate investment trust that is focused on the ownership and management of quality apartment communities located in the largest markets in the United States. Philadelphia is a primary market for Aimco, which owns and manages 13 apartment communities and more than 4,000 apartment homes in the area. Aimco is one of the country's largest owners and operators of apartments with 184 communities in 22 states and the District of Columbia. Aimco common shares are traded on the New York Stock Exchange under the ticker symbol AIV, and are included in the S&P 500. For more information about Aimco, please visit our website at www.aimco.com. To learn more about The Sterling, go to www.sterlingapthomes.com.